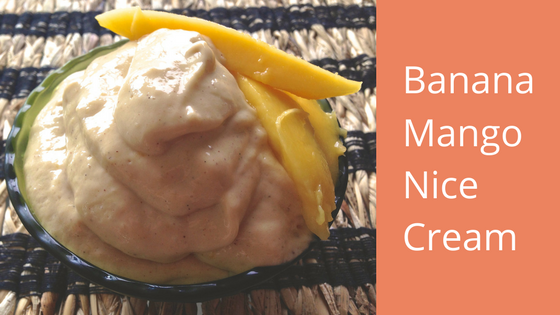 This Banana Mango Nice Cream is Healthy and Delicious! How do you healhify ice cream? By making it banana nice cream, of course! It’s so easy to make your own with frozen fruit and coconut milk or yoghurt. The combination of fruits you can use are endless really and most recipes will use banana as the base. 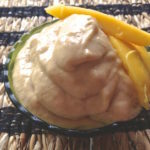 This banana mango nice cream recipe uses just four ingredients and there’s no added or refined sugars. 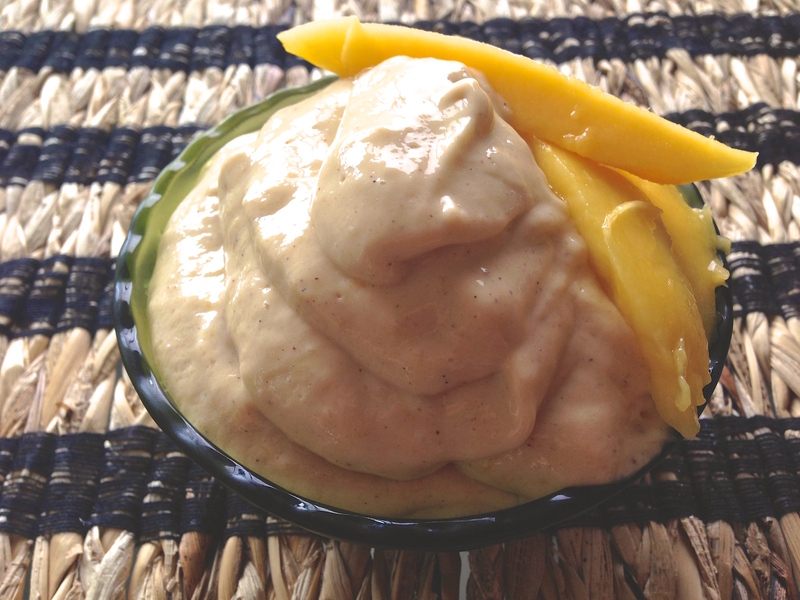 It’s simply frozen banana and mango chunks blended with coconut milk and vanilla bean paste. I think home made nice cream is an especially good natural treat for the kids, as it tastes great and there isn’t any added sugar, thickeners, stabilisers or other chemicals. You only need a high speed blender or food processor, not a fancy ice cream maker. It doesn’t need to be churned and re-churned – just blend and eat. This nice cream is ready to serve instantly, or you can blend it and put in the freezer for later. Nice cream can be eaten at any time of day; it’s yummy for breakfast on a hot day or as a refreshing treat after a hot and sweaty workout. Add some protein powder, nuts or seeds for an extra boost. You can use all sorts of different toppings on your nice cream, from chopped nuts to flax and chia seeds, protein or other powders or choc chips. 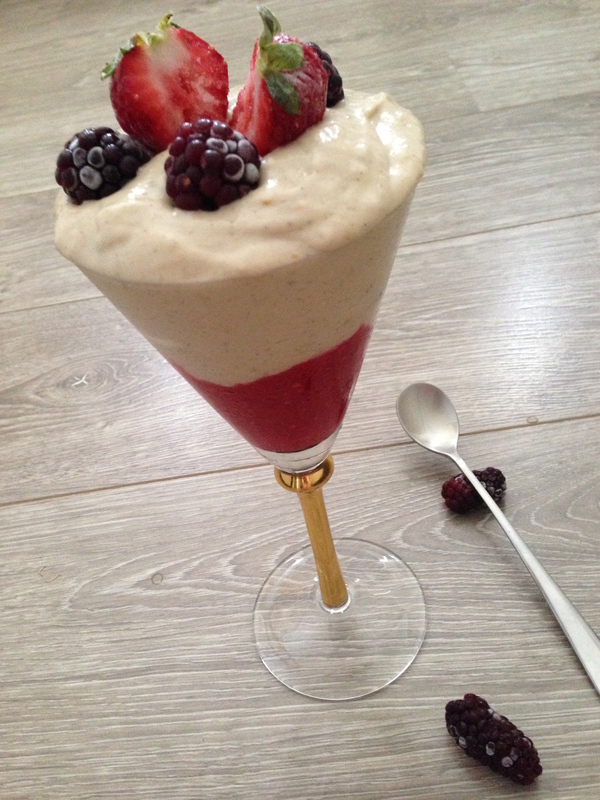 This recipe is my favourite, but banana/berry is a close second – just swap the mango for frozen berries! And these CHOC BANANA POPSICLES that taste like paddle pops! Nice cream is quick and easy to make and a lot better for you than the stuff you buy! Keep some frozen bananas in the freezer so you can whip it up whenever you get that craving. Simply place all of your ingredients into a blender or food processor and blend until smooth and creamy. Divide between two bowls and enjoy! You do need to plan ahead by freezing the bananas and mango and just in case it's not obvious - peel and chop the bananas and dice the mango before putting them in the freezer!